Bond (School Building Improvement Bond) / Cleveland H.S. 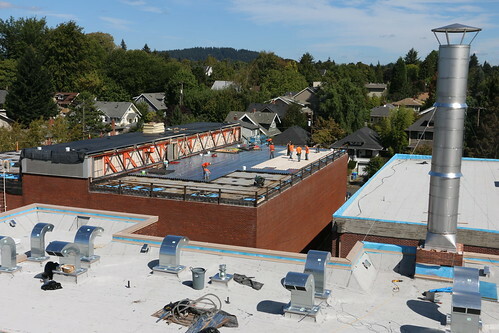 As part of the School Building Improvement Bond, Cleveland High School received a new seismically strengthened roof and accessibility improvements. Roof level seismic improvements with re-roofing that will include new insulation, rooftop mechanical, roofing materials, roof ladders and new steel trusses in the gym penthouse. Removal of the brick chimney. Accessibility improvements include new drinking fountains, handrails, accessible ramps, door hardware and two new restrooms. Construction began immediately following the end of school in June 2016. The project team encountered some unexpected issues during the re-roofing process that caused a part of the work to extend into October. However, the extended work did not negatively impact the staff and students and the school has been operating normally during the roof level construction. Please view the flyers below to learn more about the work done at Cleveland in the summer of 2016.